My Master’s Thesis for grad school was on the use of multi-genre projects in a freshman composition course to foster an interest in writing and creativity in non-English majors and students who otherwise may not have been interested in having to do a lot of writing. A multi-genre project can be done instead of a research paper, or in conjunction with one, and is pretty much exactly what it sounds like. The student (or author) uses a variety of means to tell a story or share their research. An example would be a student doing a project on Jane Austen could create newspaper articles, diary entries, interview transcripts, even write poems if they like, and all these items would be incorporated into one project. The great benefit to this kind of writing is it gets students to think outside the box, to apply their research in creative ways, and to really think about how best to structure their project and what medium would best present the information they wish to share. What does this have to do with Illuminae? Everything. 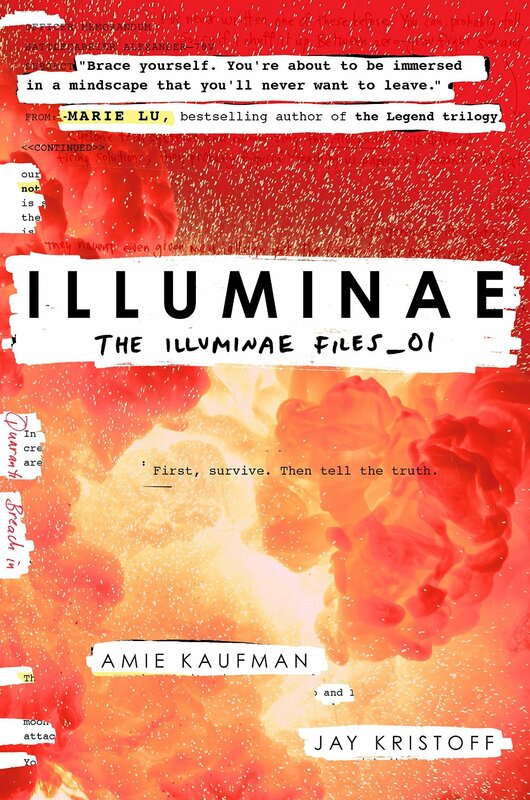 Illuminae is essentially one big multi-genre project. This novel is set hundreds of years in the future, once space has been colonized. After an attack on a mining colony the survivors are attempting to escape their pursuers and are discovering a whole new set a dangers in the process. The entire book is arranged as a large file of information. Several months after this incident, a group has been hired to sift through all information and collect it together for their employer. Therefore, the story is told through IM chats, interview transcripts, memos, incident reports, journal entries, posters, etc. It’s essentially a collection of documents that paints the picture for the reader. And it’s fascinating. Recently I reviewed The Dead House, which is told in a similar format, using diary entries, transcripts, and videos to tell the story. Illuminae goes a little bit further and uses even more variety in its storytelling methods. Also, much of The Dead House still reads like a normal narrative, while this completely feels like you’re reading a a collection of documents. Kaufman and Kristoff do a terrific job in laying out the information and telling it in a fascinating way, while using a variety of ways to tell the story. And it’s not just about the words either – there are a lot of visual elements to the way this story is told as well. This is one of those books I would definitely recommend reading as a physical book and not an eBook, because I just don’t know that you would get the same experience if you were reading it on an eReader. The story, told in this manner, is fascinating. Kady Grant and Ezra Collins are two survivors of the attack on the mining colony. They had just broken up that morning, but as time goes on and they communicate from two different ships they begin to grow close again. This book is in many ways their story just as much as it’s the story of the incident on board the ships. There’s a little bit of everything in this book. Yes, there is some romance, but it’s not just a YA romance novel. There’s space battles; viruses that turn people into psychotic killers (almost zombie-like, except maintaining their awareness and intelligence); and a damaged and psychotic computer AI willing to kill to keep others safe. This is definitely a book that would appeal to a wide audience of science fiction fans, and I highly recommend giving this book a chance if you’re interested in any of those things. Thank you! I’m glad you enjoyed it. And I hope you enjoy Illuminae as much as I did once you get a chance to read it!